What does an ultra-endurance athlete eat? I can speak for the cyclist who does really long training rides. How long? Well, lately I’ve been training for a two-day stage race, the Everest Challenge. My favorite weekend ride these days is the “double-Diablo,” which is close to a hundred miles long with 11,000 feet of climbing. It’s tough to convey, to the layman, and even to the typical cyclist, what “11,000 feet of climbing” really means. Consider this: a staircase rising 11,000 feet would have around 18,000 steps, would be about four miles long, and would take you to the top of a 900-story building. I have it on good authority that the stomach of a well-trained athlete can handle about 200 calories an hour during intense exercise. By calories I mean carbohydrates—protein and fat aren’t nearly as useful. Any sugar will do: energy bars, energy drink, energy gels, fruit. I find fruit hard to carry and bars hard to eat. So I try to drink a bottle of energy drink (160-180 calories) every hour, and eat a gel (110-120 calories) about every 90 minutes. (I bring drink mix in baggies.) The gels have caffeine, which speeds the metabolism and aids in fat burning. The worst part of this forced gluttony? It’s that I don’t even have a sweet tooth. My kids are envious that I get to have so much sweet stuff, but I really don’t enjoy it. The good news is, my stomach tolerates it pretty well—which puts me at an advantage over lots of riders, especially during a six- or seven-hour road race. An envious teammate joked to me recently, “You have a Protour-caliber stomach.” It’s true—my stomach is the one part of my body suitable for the Tour de France. 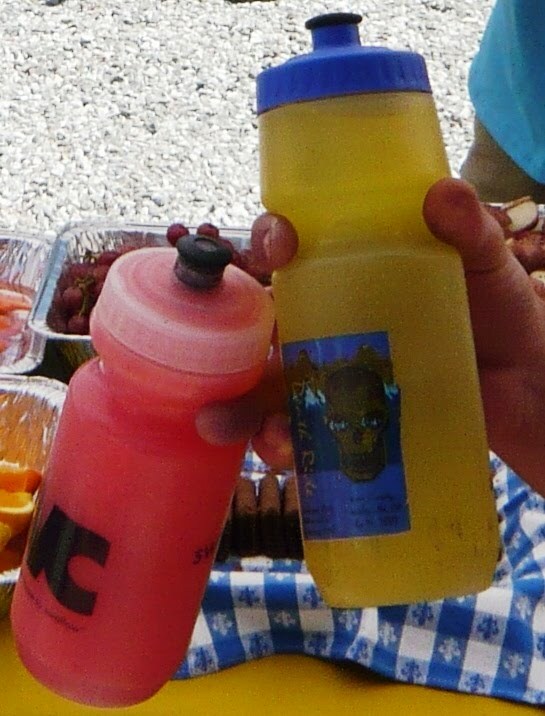 What would happen if a cyclist drank only water during rides? Well, on a short ride he’d be fine, though he might not go as fast. (Recent studies—click here and here and especially here for details—show that a sweet drink increases power output, even if it’s spat out instead of swallowed.) On a long ride, though, the sugar-free rider is doomed. He’s a time bomb: he can be hammering along just fine one moment but will suddenly crack, and then barely be able to turn the pedals. It’s pretty spectacular, but also sad, to watch. Refueling doesn’t end there, though. A cyclist can burn a thousand calories per hour on a hard ride, so it takes many meals to catch up. After a really long ride I dream about food all night. As with any dream involving appetites, satisfaction is never achieved. On Saturday night I dreamed I’d locked myself out of my office: no wallet, no keys, no train ticket … thus no food. The dreamscape shifted: now I was stuck at a boring lecture. Just as I tried to sneak out, the speaker asked me to come onstage. At that moment I discovered my hands were full of noodles. I ran for the door but dropped the noodles. Could I eat them off the floor? Everybody was watching. A cyclist can’t eat right. What I mean is, he can’t eat the same things that ideally healthy people eat—he needs more calories than that. Sunday night I offered to make dinner: “I can make gnocchi with gorgonzola, or tortellini.” My wife replied, “How about neither? I mean, we’ve got all this produce….” I thought of a dog, starving after chasing a ball all day, hearing its master say, “I could give you this Alpo … but then, we’ve got this nice chew toy!” If I eat “right,” meaning lots of vegetables and fiber, I’ll feel sated but never catch up on calories. Distance athletes have to eat wrong. They need massive plates of pasta. Sugary drinks aside, do I enjoy this abnormal caloric need? Well, sure! I laugh when I see a food product labeled “guilt-free.” The only guilt I feel, when I eat a fatty-starchy calorie bomb, is that I might be setting a bad example, or making other people jealous.